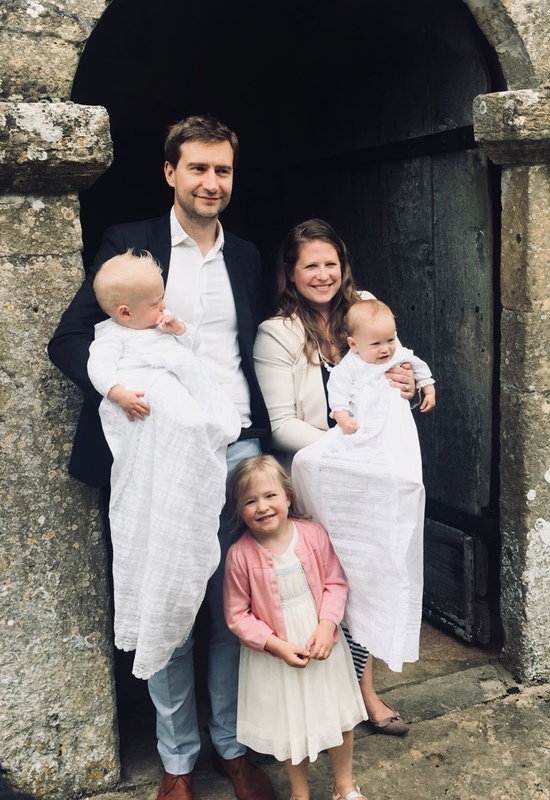 Two vintage white gowns, two twin boys, one big sister, seven wonderful godparents, five doting grandparents, siblings, friends, family, a surprisingly sunny afternoon, 15 bottles of prosecco, one poached salmon, three roast chickens, 15 meters of hessian bunting, and a church service to remember…. But, as it turns out, the heavens were smiling on us in more ways than one, and the day felt special from start to finish. 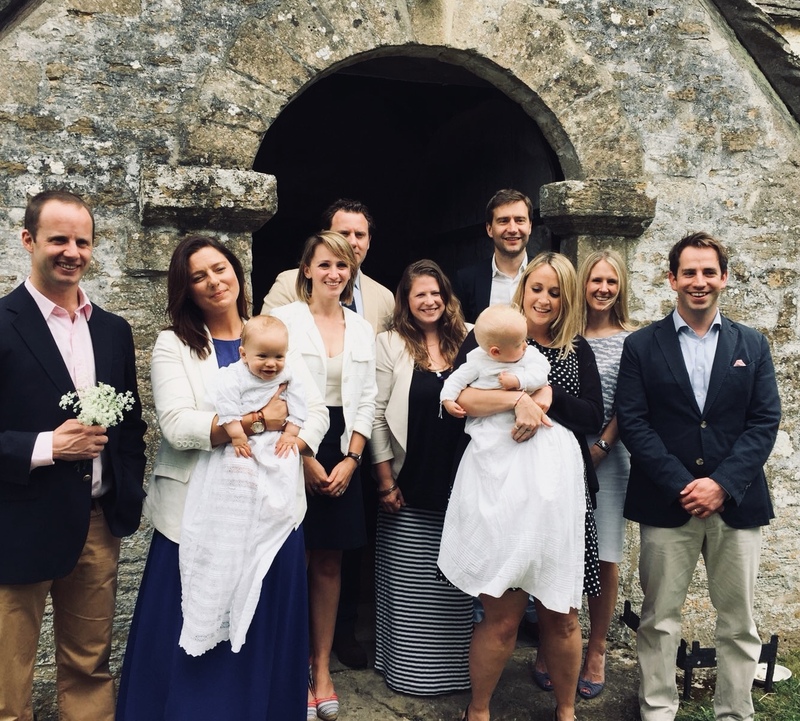 We kept it low key, just family and godparents, drinks and cake in the church afterwards, a light lunch back at ours and time for the children to play in the garden all afternoon. Sure, the boys could have napped for longer, and sure, it would have been helpful if the cistern on our bathroom loo hadn’t broken in the middle of the party. But – these are literally my only complaints. It was a day of so many happy moments, memories made, reminders of how special all the people in our lives are, and even, a timely reminder of what an incredible blessing twins are. Arranging flowers the night before, a glass of wine in my hand, nattering to my oldest, dearest friend – and Monty’s godmother – Lisa, who had flown home early from a work trip in Russia to help out. Dressing the boys in their gowns and how they just smiled and smiled at each other. The sight of family streaming through the front door that morning, armed with poached salmon, (caught by my father) and pavlova and presents and hugs and helping hands. How special it felt to have some of service conducted by our dear friend Alex, best man at our wedding and in training to become a vicar. He wrote a beautiful sermon for us, that was personal and touching, funny and thoughtful. 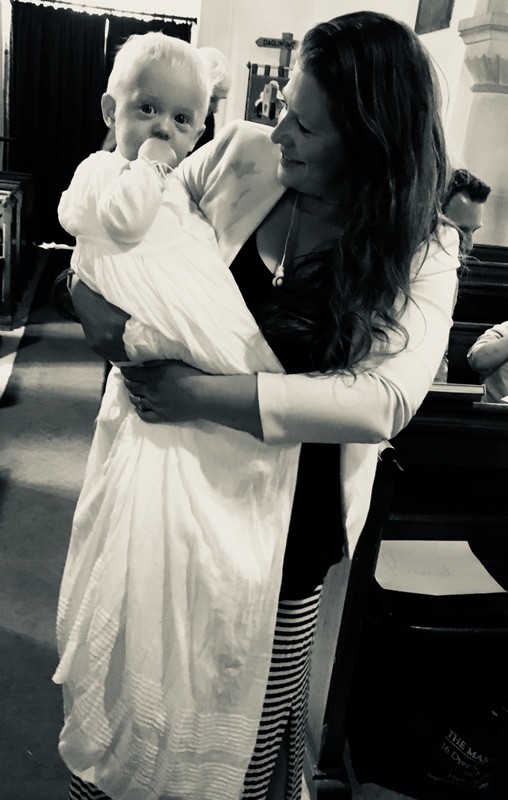 He referenced our passion for our children, and for each other, the commitment we were making in having the boys christened, his own journey through faith and his promises to the boys as their godfather. It was wonderful. The sight of all seven godparents – two couples who are all dear friends, my stepsister and official baby whisperer, Amelia, our friends Lisa, and Alex, all standing together around the boys, promising to be there for them. And knowing how much all of them, have already been there for us. The sight of the sun, streaming through the windows of the church as our dear friend Alex read his sermon from the pulpit. 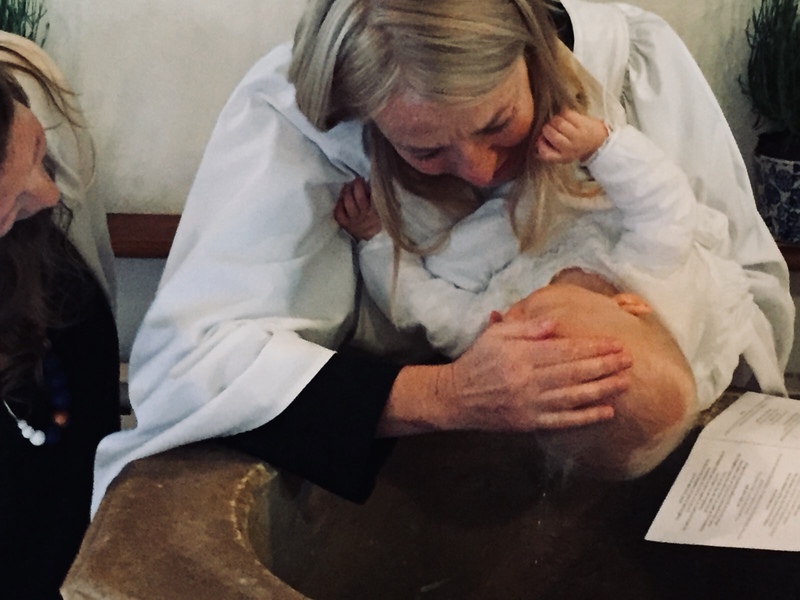 The way Felix – nervous-of-new-people-Felix – reached for the vicar when she held him, touched her face and smiled at her, and then happily allowed himself to be doused with water, looking around quizzically afterwards. The sight of so many villagers, and our next door neighbours, sitting in the church too, part of our day. The way Monty scrunched up his shoulders and smiled at the vicar as she made the sign of the cross on his head. 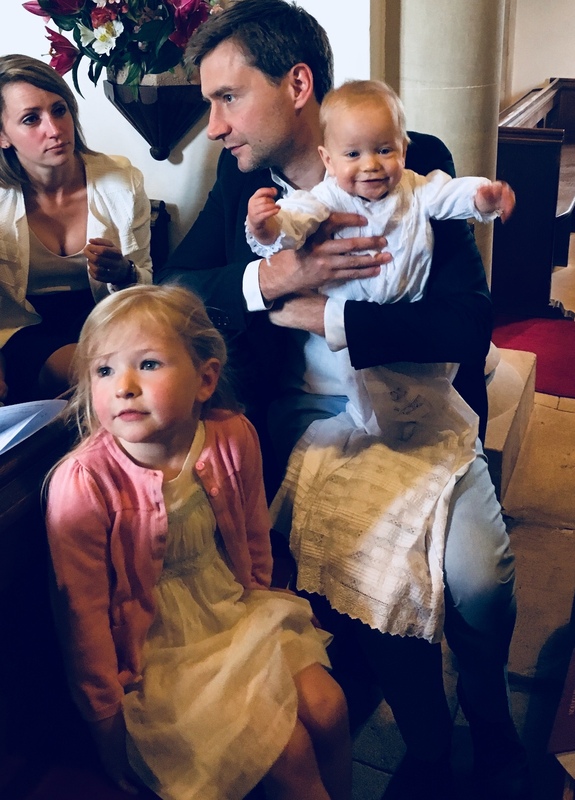 The prayers in the church, written specially for us, that asked God to give us energy we needed to be parents, to give us the support we needed to help each other, and thanked God for the blessings of family and children, of siblings and friendship. The fact that the vicar personally asked a lady from the village, who also has twin boys, to be the one to light a candle for each of the boys and read them a blessing at the end of the service. The bubbles the vicar had brought with her for the younger children to play with during the service, the sight of them fluttering around the font, and Felix and Monty gazing heavenward at them. The sight of family and friends, happily milling about our house, drinking, eating, talking and laughing in the sun. It was a really magical day. GOWNS: The boys’ gowns were family gowns, Victorian at least, made of vintage cotton and Honiton lace. They looked amazing on the boys, not showy or over the top, but just perfect. I am so pleased they still fitted. CHURCH: The service was a special one, not part of the weekly Sunday services. We had one reading – Ode on the Whole Duty of Parents, by Frances Cornford – and two hymns – Be thou my vision and For the beauty of the earth. 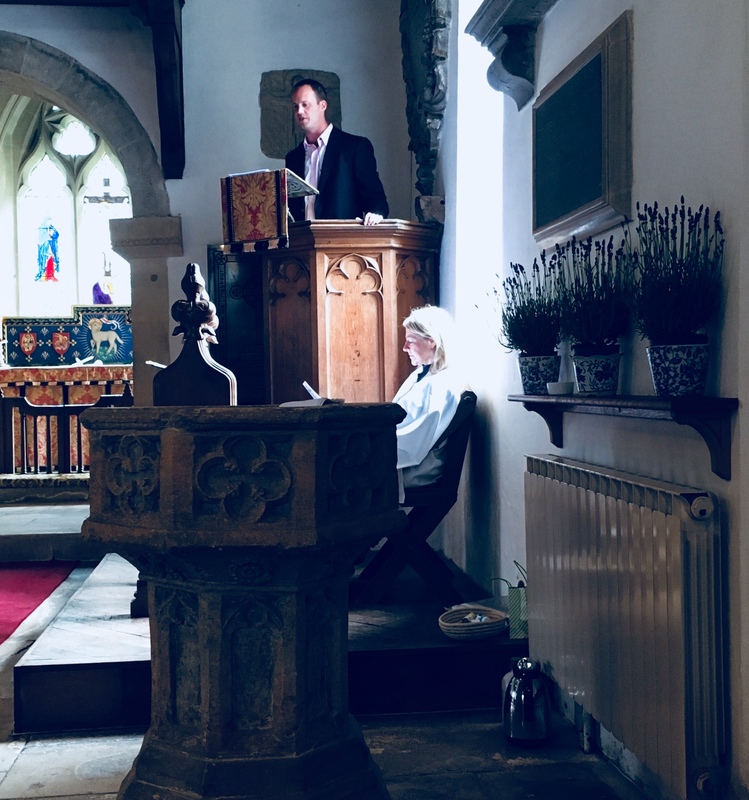 Our sermon, prayers and bible passage were read by our friend Alex, while the local vicar conducted the christening itself, on the ancient font, which dates back to the 15th century and is most notable for the carving of the Green Man, hidden in the carved stone foliage under the overhang. He has been a symbol of health, harvest and fertility since pre-Christian days. From start to finish, the day was just filled with family and love and friendship and happiness. Days like this – at the moment – for us, seem few and far between, so it is so lovely to have so many happy memories of this one, which will no doubt keep us going in the dark, yawning nights ahead. Thank you to everyone who was there, family for all their love and help, to friends for their kindness and generosity, to all the godparents who do so much for us, and our siblings who have our backs no matter what. Thank you to you all.